Runners start the race from a standing position along a curved starting line and after hearing the starting pistol they head towards the innermost track to follow the quickest route to the finish. 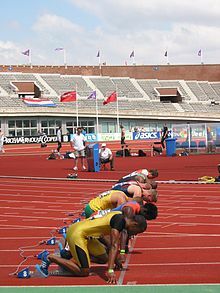 In 800 m races athletes begin at a staggered starting point before the turn in the track and they must remain in their lanes for the first 100��m of the race. 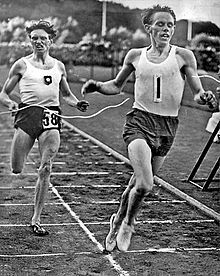 This rule was introduced to reduce the amount of physical jostling between runners in the early stages of the race. 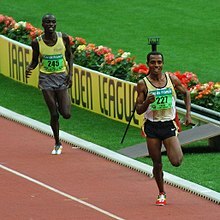 Physiologically, these middle-distance events demand that athletes have good aerobic and anaerobic energy producing systems, and also that they have strong speed endurance.